Manchester United and Aston Villa legend follows SSC on Twitter!! - Football training for children, football coaching for kids, kids football skills. Soccer Star Coaching.Football training for children, football coaching for kids, kids football skills. Soccer Star Coaching. Manchester United and Aston Villa legend follows SSC on Twitter!! 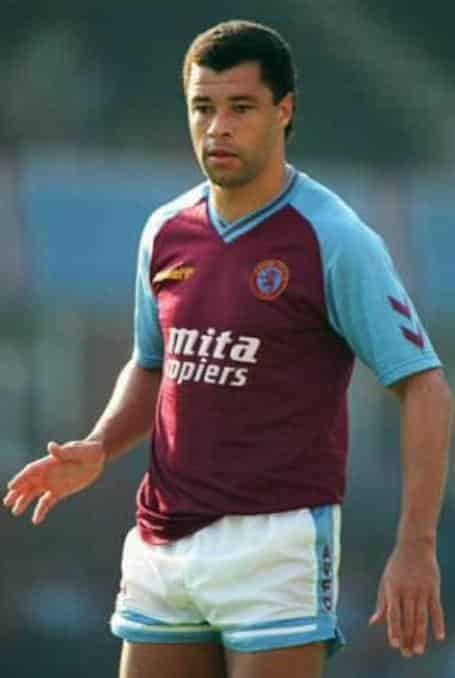 Aston Villa and Manchester United legend Paul McGrath showed his support for Soccer Star Coaching by following us on Twitter, helping to spread the word on our Soccer Courses and Camps for children. Head coach Justin is a good friend of Paul’s son, Chris. 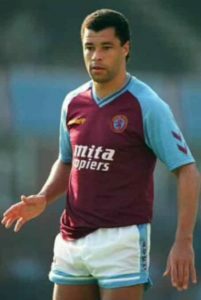 At Villa, Paul McGrath played some of the best football of his life despite recurrent problems in his knees. Villa came close to winning the title in McGrath’s first season, finishing second to Liverpool F.C. The next season saw Villa fighting relegation for much of the season, a shadow of the side the previous season under Graham Taylor, who had left to take control of England. Atkinson then took over and Villa again ended as runner-up, to McGrath’s former employer Manchester United. McGrath won the PFA Player of the Year award at the end of the season, and would also win his first Villa trophy in 1994, defeating Manchester United in the League Cup final. In 1990, Ireland qualified for their first FIFA World Cup in Italy and got through to the Quarter Finals, eventually losing out to Italy in Rome by 1-0, with McGrath ever present in the lineups (5 matches, 480 minutes played). He captained the team four times in 1992 after the retirement of Mick McCarthy, and ignored a painful shoulder virus to play in the 1994 World Cup. Ireland came up against favorites Italy in the first match and got a dream start thanks to Ray Houghton’s early goal (1-0 win). In a perfect example of his commitment to the game, as Ireland were leading and Italy were besieging the opposing goal, McGrath was marking Roberto Baggio (voted best player in the World at the time) who had the ball at his feet. McGrath slid across Baggio’s front and tackled the ball straight off his toes, knocking it back to the feet of an Italian player, who immediately chipped the ball into the air, to try and set Baggio up for a half-volley. As the ball was dropping, McGrath got off the ground, leapt up and headed the ball away, beating Baggio in the air. McGrath landed on all fours, facing out from the goal. The ball landed on the half-volley right in front of an opponent who shot for goal, with McGrath taking the shot straight in the face and immediately beginning to chase the ball. McGrath single-handedly kept the star-studded Italian forward line at bay for the rest of the match, in what was arguably his best international performance, and would eventually receive votes in the Team Of The World Cup poll.